Tourists are quite rare in this area, so if you are interested in seeing local people's life and attractions then you should definitely spend some time here. The Navigli are a system of canals and waterways whose construction lasted 7 centuries (started in XII century) that connected the lake Maggiore, the lake Como, the Ticino river and the Po river and also connecting Milan with Switzerland, North Eastern and Western Europe and to the sea and irrigate and productive huge areas. Campane Marinelli foundry has a very long history. The first bell was made around the year one thousand. Now they made the EXPO bell which at least for now is located near Porta Ticinese in Milan. Porta Ticinese dock, also known as the Darsena. The canal port closed since 1979, when the last boat left its load of sand on the dock. In Darsena there are attractions for all family members. Music, sports, restaurants, toy motor boats. Naviglio Grande is the biggest and the most well known canal. 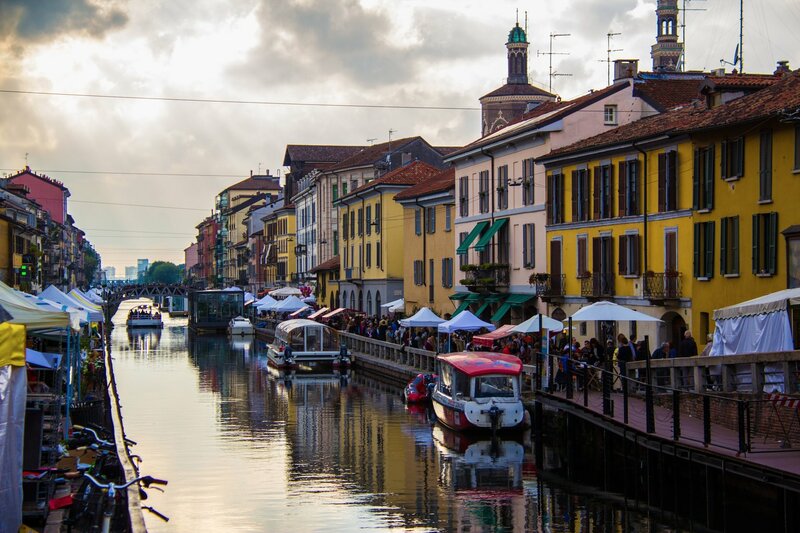 There is a marketplace each last Sunday of the month starting in September along the Alzaia Naviglio Grande. This is an antiques market selling furniture, objects for the home, old books, jewelry, spices, etc. Finally we're back at the Porta Ticinese. If you'd like to continue the walk you may head towards the tower of the Basilica di Sant'Eustorgio. It was built in 12th century and there's a belief that it hosts the remains of 3 kings which brought gifts to Jesus.